Dear asparagus: I’m sorry. I’m sorry I said that peas are better, I’m sorry that I called you a “giant grassy thing,” I’m sorry I called you ‘sparrow-grass’, which I know brings up issues you’ve been working on with your therapist. I’m sorry. But now that I’m posting this, will you please stop haunting me? Dear everyone-who-isn’t-asparagus: After I so rudely insulted asparagus last week, wouldn’t you know it? I couldn’t get asparagus out of my head. Morning meetings: little sketches of asparagus in the margins. Lunch: thoughts of ‘this would be better with asparagus’. Looking out my window at home: long-range dreams of planting some asparagus crowns and harvesting fresh asparagus in 2-3 years. It was really getting to be a problem, and so I finally broke down and bought some asparagus at the grocery store instead of waiting for it to show up at the farmer’s market, like I do most years. I knew I wanted to do something outside the norm, though. It’s not that there’s anything wrong with simple steamed asparagus (maybe with a nice hollandaise? 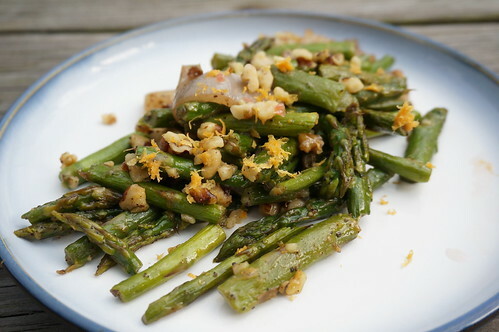 ), or with a classic roasted or grilled asparagus (tossed with some butter and garlic), but there are plenty of those recipes out there, and I knew that if I wanted to exorcise the asparagus-demon haunting me, I’d need to post about it — something more interesting had to happen. So this is a riff on a classic roasted asparagus, crossed a bit with a green bean almondine. The shallots are nice and sweet, and really would be lovely as a sidedish unto themselves; here they both richen and sweeten the asparagus, and their pale purple is beautiful to look at. The grapefruit comes in twice, with a flurry of zest topping the dish and the juice making a light dressing. And then the walnuts give the whole thing a little more heft, while also smoothing out some of the tart spice from the grapefruit juice. The whole thing’s helping me get through the interminable winter-to-spring transition, and maybe, just maybe, it’ll get asparagus off my back! Preheat the oven to 400°F, and line a rimmed baking sheet with foil if you’d like to reduce cleanup effort. First, prep the asparagus. Trim or snap off the woody ends and break the stalks into largish pieces, an inch or so in length. 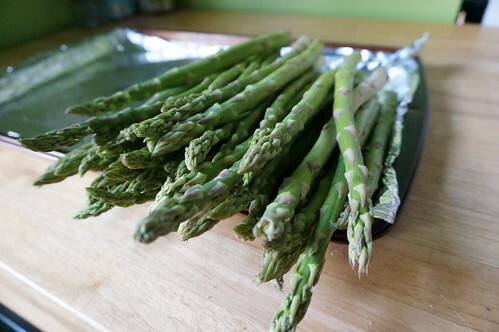 Combine the asparagus with the shallot chunks and toss with 2 Tbsp olive oil, the salt, and the pepper. 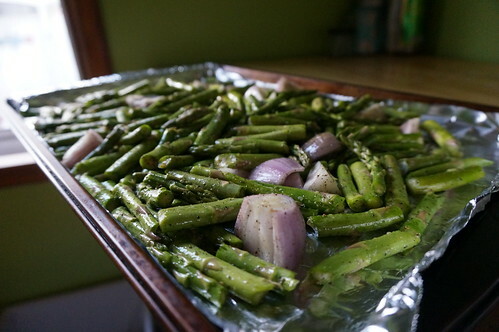 Pour the dressed asparagus and shallots onto the baking sheet and roast for 25 minutes, tossing occasionally. When the asparagus and shallots are tender and lightly browned, remove from the baking sheet and toss with the juice and olive oil. 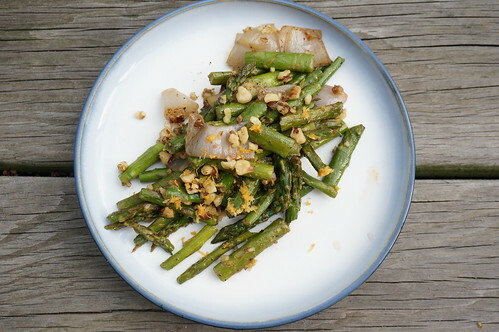 You can toss the walnuts and zest along with the juice and oil, or — if you’re feeling fancy — transfer the asparagus to a serving dish and sprinkle the zesty nuts over as a garnish. I find long floppy asparagus tricky to handle, especially if nothing else on my plate requires a knife. But if you like your asparagus whole, that’s totally fine. Despite being a vegetarian for almost 15 years now, I have somehow never eaten asparagus in my life. Your recipe might be the first one I try! I’m honored to potentially be your introduction to the joys of asparagus!